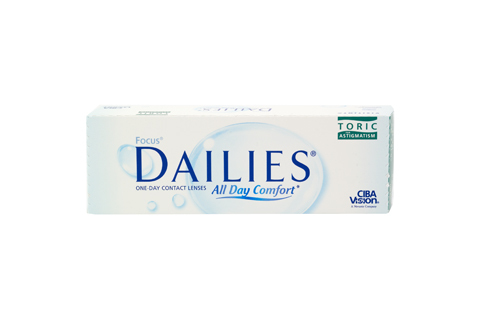 Focus DAILIES Toric are daily lenses for eyes with astigmatism. Toric contact lenses have the advantage over glasses of a wider field of vision, as well as the comfort and freedom which come with wearing contacts. With a well-fitted lens you'll be seeing clearer than ever! Daily lenses are disposed of after use and replaced the next day with fresh lenses straight from sterilised packaging. As a result Focus DAILIES Toric are perfect for people who only occasionally use contact lenses, for example for sport, at the beach or going out at night. Sterilely packed lenses are also great for people who suffer from allergies. Focus DAILIES Toric distinguish themselves from other daily lenses through ease of use, instantly high comfort and top quality materials. Find out about the great offers and discounts of up to 10% when you order Focus DAILIES Toric and cleaning products in the Mister Spex online store. Mister Spex advises all online purchasers of Focus DAILIES Toric contact lenses: the contact lenses, Focus DAILIES Toric, should always be fitted to your eyes by an eye doctor or optician. The period between fittings, unless otherwise prescribed by an eye doctor or optician, should not exceed 6 months. You should go for regular check-ups. The manufacturer Ciba Vision/your eye doctor/optician's recommended wearing time for Focus DAILIES Toric contact lenses should be followed strictly. It is your own personal responsibility to make yourself aware of the care instructions for Focus DAILIES Toric contact lenses and to follow them accordingly. In case of eye irritation or visual impairments caused by Focus DAILIES Toric, remove the contact lenses immediately and consult an eye doctor or optician. Damaged contact lenses should be replaced immediately.